Appropriately enough, January 2017 has a new horror movie out every weekend, including a particularly terrifying one on January 20th (that's M. Night Shyamalan's latest, Split, which is about a demented, raving lunatic who lurches from common sense to cruel insanity at the flicker of a second). Other than that, January seems to be pretty much ceding ground to 2016's numerous December expansions, one or two of which will easily win the month. In a month where most new films are B-movies and genre thrillers, the unusually supple amount of expanding Oscar contenders will dominate. Smaller titles like The Founder, Silence, and A Monster Calls may run up their numbers over many weeks, but two films should do well right off the gate, even if neither of them is particularly likely to be up for the bigger awards. The first is Patriots Day, which leads an unusually crowded slate on the second weekend of January. It is the movie that will presumably outgross all comers. Patriots Day documents the Boston Marathon bombing of April 15, 2013, from the day's early morning hours to the subsequent hunt for its two perpetrators. The film reunites director Peter Berg with star Mark Wahlberg, after Lone Survivor in 2013 and Deepwater Horizon a scant few months ago, in a film that like those two aims to give a respectful depiction of a recent American tragedy: as befit a true story, the trailer sells Patriots Day as a mix of thriller suspense and emotional uplift. The female lead is played by Michelle Monaghan, in one of her two films that weekend, and character actors like Kevin Bacon, J. K. Simmons, and John Goodman fill out the Boston citizenry and officials, many playing real people and some amalgams. The blue-print for the film's late December platform release and early January expansion is clear: Lone Survivor was a strong expander over the same slate in 2014, and American Sniper made a whole lot of money over this long weekend a year after that. History might repeat itself, at least part of the way. When predicting Deepwater Horizon, I wrote that Wahlberg both "exudes the right working-class star power" and "opens this kind of film extremely well," and even though my forecast was off by a good $50 million or so, I will repeat the argument here. From the other tonal end of the Oscar contender pool is this expander, a film that, with its premise of common decency and goodwill towards men and women would have been a much better fit to open wide a few weeks earlier, to fit into the holiday season. 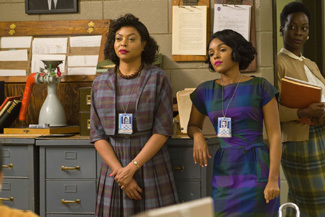 Hidden Figures is the true and little-known story of black female mathematicians who helped shepherd NASA's space program in the early 1960s, running up against both the cold majesty of space and the cruelty of man. The film is headlined by Octavia Spencer, who won an Oscar for The Help and is thus no stranger to important historical films; Taraji P. Henson, now a breakout television star; and singer Janelle Monáe, who has also received some strong plaudits for her role in the smaller Moonlight. Helmed by Theodore Melfi, whose first film, St. Vincent (2014) was funny and warm, it also stars the storied Kevin Costner, Jim Parsons, and Kirsten Dunst, as well as rising actor Glen Powell as the now dearly departed John Glenn. I hope he saw it. Hidden Figures' marketing campaign seems to have a lot of goodwill and energy behind it, with reviews confirming and endorsing its quality (94% on Tomatoes). I may be underestimating the film's opening weekend, but however big the difference, its legs over the next few weeks should be strong enough to put it in contention with Patriots Day, because this looks like the kind of uplifting biopic that plays well over awards season.